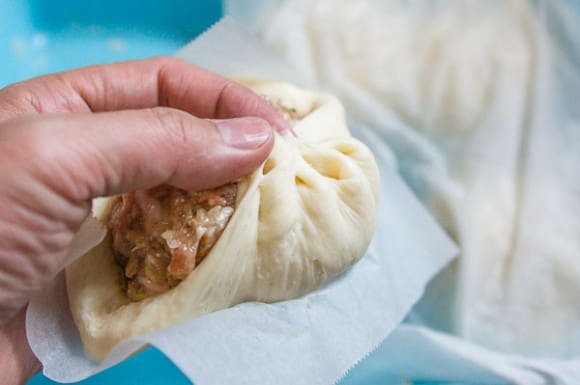 Nikuman, also known as Baozi is a Chinese sweet bun filled with a succulent meat and onion filling. 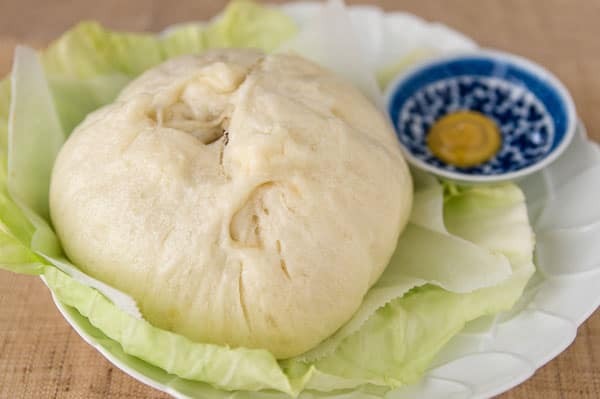 Nikuman (肉まん), also known as Bāozi in China, are the Asian equivalent to sandwiches in the West. With a savory meat and vegetable filling wrapped in dough and steamed, they make a complete meal that can be eaten on the go without utensils. While convenient, I’ve always been a little wary of the mystery-meat filled bun you can buy at the store. They taste good, but the bleached white dough is often too sweet, the skimpy filling a little prepubescent, and the unidentifiable meat inexplicably pink. On a recent trip to Kyoto, I made the mistake of boarding a noon train without buying lunch. By the time the bullet train reached Kyoto station I was ready to start gnawing on the seat in front of me. It didn’t help that the guy sitting next to me had brought on a bento box and a tallboy of beer. As I entered the station from the platform, the sweet smell of pork perfumed the air. Led by my nose like a bloodhound, I soon found myself standing in front of a stalled called Horai 551, in line with a bunch of other hungry travelers. I don’t know if it was my hunger or Horai 551’s recipe, but it was the best nikuman I’d ever had. With a relatively thin bun and incredibly soft and juicy filling redolent of onions, I ended up back in line for a second bun. I’ve been trying to recreate Horai 551’s nikuman since that trip, getting closer with each batch. Today’s batch not only met my expectations, I dare say it was better than Horai’s. The filling is moist and tender with loads of umami coming from the meat, mushrooms and onions. 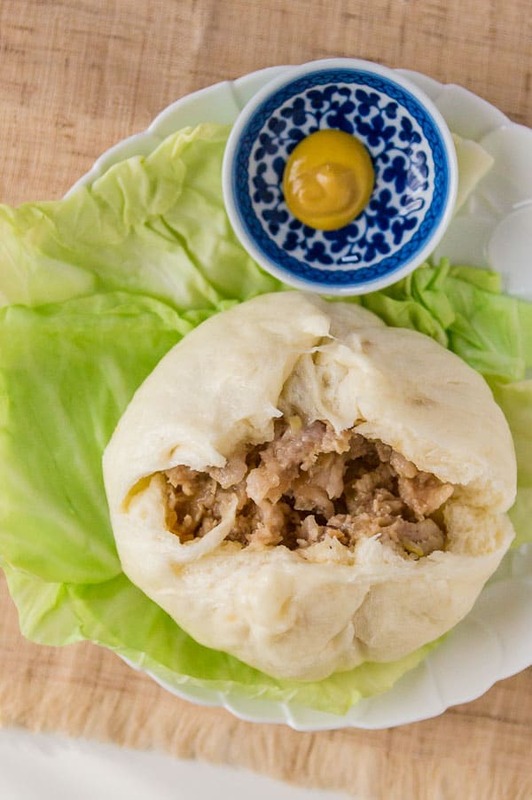 The fluffy, mildy sweet bun is a wonderful contrast to the dense savory filling. 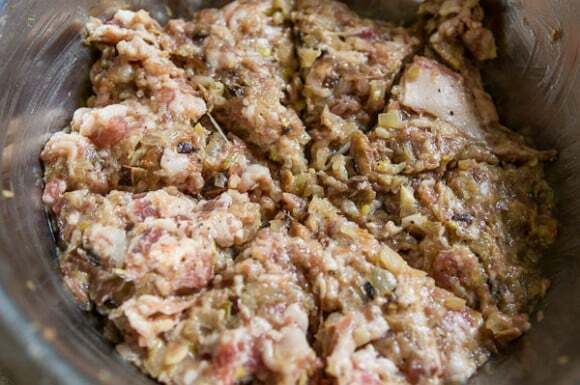 The trick is to use a mixture of ground pork and sliced pork belly, the extra fat ensures that your filling is juicy. The trouble is, too much juice, and your bun gets soggy. That’s where the cornstarch and egg white comes in. They not only act as a tenderizer, they also help bind the juices to the meat so they don’t absorb into the bun. This recipe makes 8 large meal-sized buns, but you can just divide everything into 16 segments to make appetizer sized buns that are perfect for bringing to potlucks. They’re best straight out of the steamer, but they do take a bit of time to make, so I like to make a large batch and freeze them. Nikuman keeps for about a month in the freezer. To bring them back to life, just wrap them in a damp paper towel and microwave for a few minutes. Mix the flour, sugar, yeast, and baking powder together in the bowl of a stand mixer, then add the water and oil and combine. When the ingredients are combined, affix the bowl to a mixer fitted with a dough hook and knead until the dough is elastic and shiny. You can also knead the dough by hand if you don't have a mixer. Form the dough into a ball and put it in a bowl and cover with plastic wrap. Place the bowl in a warm place and let the dough rise until its doubled in size (about 1 hour). While you're waiting for the dough to rise, make the filling. Sauté the onions and scallions with the sesame oil over medium heat until translucent, but not browned. Set them aside to cool. In a bowl, combine the pork belly, ground pork, shiitake mushrooms, ginger, oyster sauce, soy sauce, sake, sugar, black pepper, cornstarch and egg white and knead well with your hands (gloves are advisable), add the cooled onions and continue kneading until the meat is shiny and well combined. Punch down the dough and roll it into a log. Cut the log into 8 even pieces and form each piece into a ball. Space the balls apart on a baking sheet and cover with a damp towel to keep them from drying out. Let the dough rest for 10 minutes. Use a sharp knife to divide the meat filling into 8 pieces. 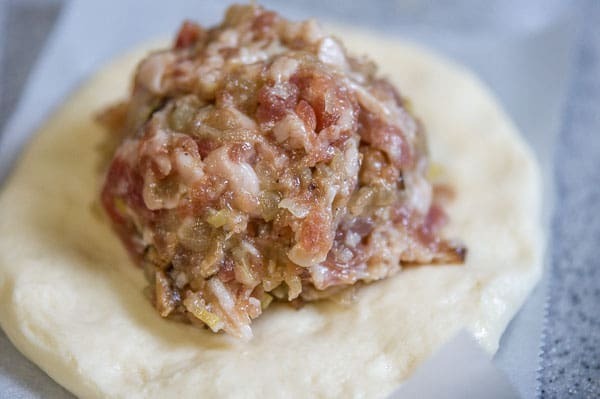 Flatten a piece of dough on a parchment square until it's about the size of the piece of paper, and then scoop 1/8th of the meat filling onto the middle of the dough. 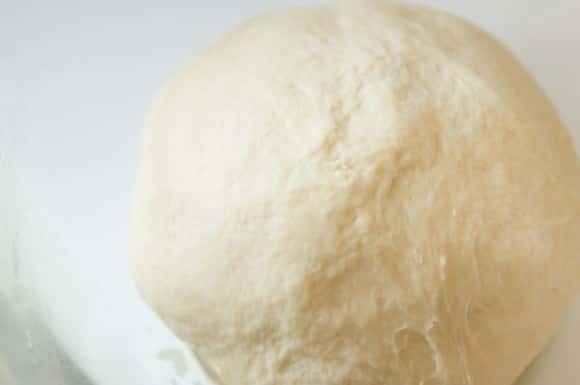 Pinch one edge of the dough with your right hand and twist it up towards the center of the bun. Use your left hand to hold the flap in place. Repeat about 10 times, always bringing the flap up to your left hand and pinching together with the past flaps. Cover the finished buns with a damp towel to keep them from drying out. Fill a steamer with water and boil the water. Place a few buns into the steamer basket, being careful not to overcrowd it as the buns will expand. Lower the steamer basket into the pot of boiling water. 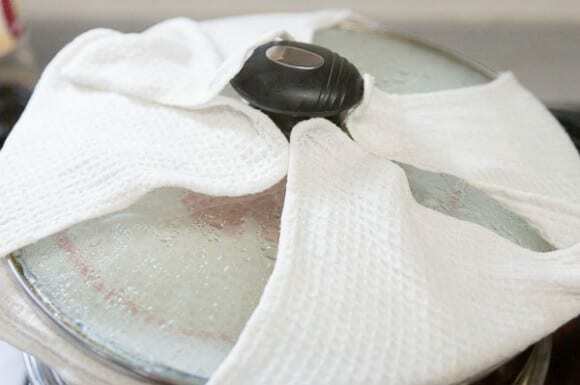 Cover the steamer with a damp towel and cover with a lid. This prevents the steam from condensing on the lid and dripping onto the buns. Fold the dangling flaps of the towel back onto the lid to prevent the towel from burning. 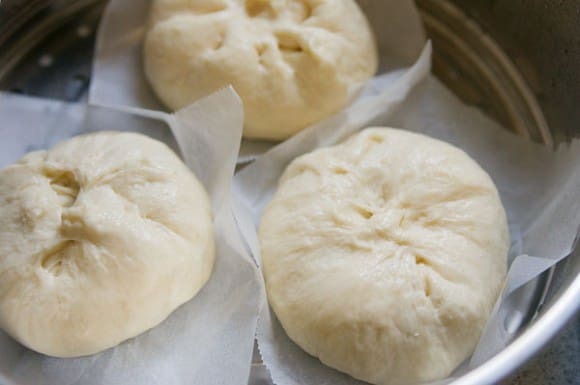 Steam the buns for 15 minutes. Depending on your steamer setup it may take a little more time, so split one open at 15 minutes to make sure it's cooked through. Serve the nikuman with spicy mustard, hot sauce, or vinegar. i am sooooo hungry right now! This looks amazing! Thank you for the very clear images and instructions. Taking the time to do step by step instructions is so helpful. I plan on trying this recipe soon. Ohhhh yum! I loovveee Meat Buns! I can’t wait to get to try it out myself at home! Hold on! No nira or 5 spice powder? Sorry, the giant Nikuman was not 20″, but 20 cm. Chinese restaurant on Kagurazaka is still there and very famous. The name of the restaurant is Gozyuban 五十番. They are known for buns, shaomai, etc. The giant Nikuman is called Gomoku Nikuman ごもく肉まん. Some of the ingredients in the filling are boiled quail egg, whole shrimp, white mushroom, pork, and it may have had ginko nuts. On their website photo, the giant bun looked fluffier and smaller than the bun I had at the restaurant. Thanks, Marc! I’m going to Kyoto soon, so I’ll check out Horai 551. And I’ll try your version, too! Not sure if you’ve ever had the ones at Horai 551, but there is no nira or 5 spice in theirs. You’re obviously welcome to add those ingredients in if you like. Wow, that looks amazing! I too always fear the risk of overly sweet (and sometimes rubbery ick!) white dough and minute filling of steamed buns. I also didn’t realise how simple the recipe is (well, you make it sound easy anyway!) Sounds like a fiddly job though, but def worth it, from the look of it! I didn’t mean to post a massive pic of myself in my previous comment below, I thought that option was for the little profile pic on the side of the comment box, lol! I love love love 551’s nikuman! I always looking for better nikuman recipe and I will definitely try this. Your ingredients on steamed buns sounds flavorful and thank you for the tips on the binders. Fabulous recipe, incredible taste, horrible steamer! Using my bamboo steamer has yet to go well for me. After 45 minutes of steaming, they still were not quite done. Any hints or suggestions on bamboo steaming…or alternate cooking methods? Hi Lisa, I used a regular metal steamer (pot + elevated colander). I’ve never actually used a bamboo steamer, but my guess is that it’s not retaining as much heat as using a metal steamer. Try making the buns smaller. Otherwise you might want to think about using a different steamer setup. I really enjoy visiting your blog. What a fantastic job you have done! I am desperate to try this Nikumanni recipe. Looks scrumptious! Yep, but it will effect the texture of the finished bun (it will be more like a meatball inside). I tried the recipe today, love the dough, very easy to make. Next time I will divide the dough to 12 portions to have smaller buns and add Chinese sausages and quail eggs to the filling. Thanks. I used the steamer basket that came with the rice cooker. It’s working great. What a great recipe. I love the nikuman sold in China town in Yokohama. This maybe very similar to that. Thank you for sharing. My dough is waaayyy to sticky! I cant even roll it into a log 🙁 what went wrong and how can I fix it”?? You should be able to firm it up by adding flour, but the dough should be on the soft side. It will be sticky at first, but as you knead it the gluten chains that form should Make the dough shiny and less sticky. As for what went wrong it’s hard to say. What kind of flour did you use? Was your kitchen scale zeroed out when you started measuring the flour? Adding some flour fixed it! The buns are a big success, thank you!! DELICIOUS!! Yep, they’ll keep in the fridge for a few days. If you want to keep them longer, wrap them up in plastic wrap and foil and freeze them. To rehear, just unwrap them, cover with a damp paper towel and microwave. Is that dry yeast or live yeast? 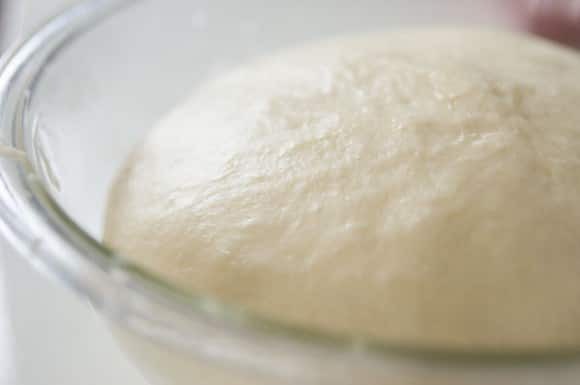 All yeast is alive, otherwise it would not leaven your dough. I made this using active dry yeast. My husband made these yesterday! So good! We steamed 3 and have 8 more waiting for us in the freezer! Great recipe. Could use a bit of seasoning though, no? i really like this receipt since that’s how we make baozi inChina, savoury(not deep sweet) and moist. Oh my goodness… I’m salavating. I will have to give it a try. I actually made these and they were great. Better than anything I’ve tried in restaurants. I’m going to add more seasoning next time. Maybe I didn’t measure the seasoning right the first time, but they were still good. I made it again. I figured out that I didn’t underseason it the last time I made it. Instead, I weighed the meat which I know was a lot less meat than the last time I made it. This time, the results were so delicious. Perfect. This is the perfect nikuman recipe. Thanks. do I steam them first and then freeze them or do I freeze the Nikuman’s while they are still raw (pre-steam)? They need to be steamed first otherwise they will stick together and make a mess. Just steam, cool and freeze. You can reheat in the microwave. Unless, of course, you make dousha baozi!